Gordon and Greenberg is a 10-person, design-oriented architectural firm with an excellent reputation for producing high quality work. For over 50 years, we have been committed to design excellence, technical expertise and client service. Our work has established our reputation among clients and peers as an innovative, progressive and responsive architectural firm. Gordon and Greenberg integrates the use of digital tools throughout the design and execution of our projects, enhancing the firm’s ability to respond to changes in project requirements and improving the accuracy of project scheduling and evaluation. Computer Aided Design (CAD) and Building Information Modeling (BIM) tools enable efficient communication among the team and project stakeholders and enhance project control, coordination and retrieval of data for use in new work, facility management, tenant work, and future additions to facilities. We apply our fundamental principles to each project: we view each building program with a fresh, imaginative approach, analyze the functions and environment, and strive toward an appealing, coherent building as an expression of its time and context within the given budget. We are cost-conscious designers working with the premise that we must obtain the maximum efficiency and the most attractive results to meet the owner’s requirements. The myriad experiences gained in previous projects are brought to bear on each new project. The firm’s extensive experience assures our clients that we will design distinctive, functional, and cost-effective buildings. Our design process is an ongoing dialogue between the client and the architect: a continuous interchange of ideas that provides the best solution to the client’s specific program requirements, budget and schedule. The principals’ involvement with each project emphasizes our dedication to quality service. The success of this system is evident by the number of clients retained over the years. Gordon and Greenberg is committed to the principles of sustainable design: energy efficiency, environmental stewardship and respect for the community. The firm is committed to educating itself and our clients in the current economics, technology, regulatory and design initiatives impacting sustainable design. The Gordon and Greenberg office is staffed by two registered architects, a project manager, two senior CADD technicians, an architect/CADD administrator and administrative staff. Three staff members are LEED Accredited Professionals. Due to the size of our office, the Owner can be assured that a principal of the firm will actively manage the project and will respond quickly to the project’s needs. Gordon and Greenberg specializes in hospitality, lodging and resort facilities, conference centers, office buildings, commercial and retail space, multi-family, warehouses, and historic adaptive reuse projects. Gordon and Greenberg has long been a leader is hospitality design in the Mid Atlantic region. In the hospitality field, we have long-standing relationships with all the major franchises including Marriott, Hilton, Choice, Intercontinental, Hyatt and Starwood. Our client base is almost entirely referrals and repeat clients. Even in a challenging business environment, we continue to work with long-standing clients to design and build hotels in various jurisdictions. Our work to date has been built as far north as Massachusetts, as far south as North Carolina, as far west as Ohio and east to the Atlantic Coast. Gordon and Greenberg is at the forefront in sustainable hospitality design. The Fairfield Inn and Suites at the Inner Harbor in Baltimore, completed in 2009, has achieved LEED (Leadership in Energy and Environmental Design) Gold certification for New Construction. 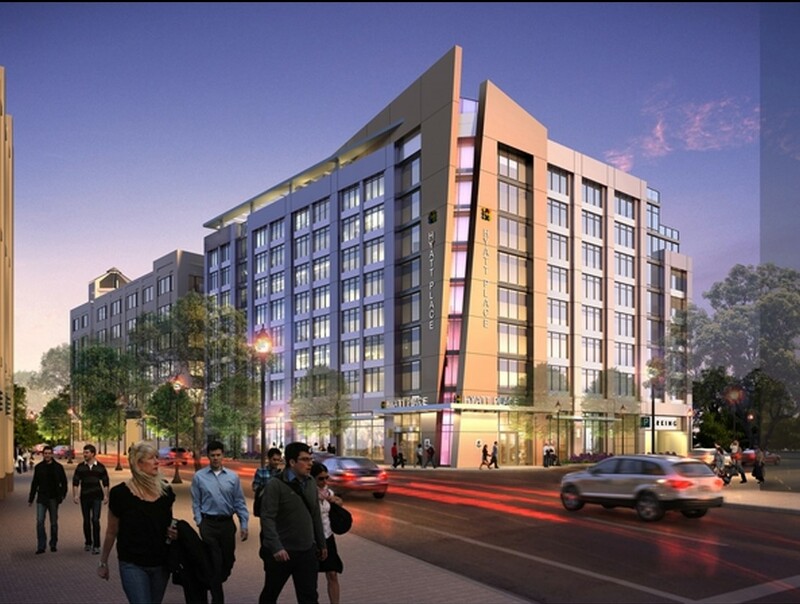 It is the first LEED certified hotel in Baltimore and the first LEED certified Fairfield Inn and Suites in the system. This hotel won a Special Recognition Award from the Maryland Chapter of USGBC (US Green Building Council), a Wavemaker Award from the Baltimore Chapter of the Urban Land Institute, and the Baltimore Business Journal Green Development Award, among others. Successful interactions with local planning and zoning commissioners and staff and building officials is essential to the success of every project. We strive to stay abreast of continually updating codes and standards. We treat these public servants with respect and foster an attitude of cooperation. Increasingly, local jurisdictions are implementing “green” building laws requiring LEED (Leadership in Energy and Environmental Design) or equivalent certifications.